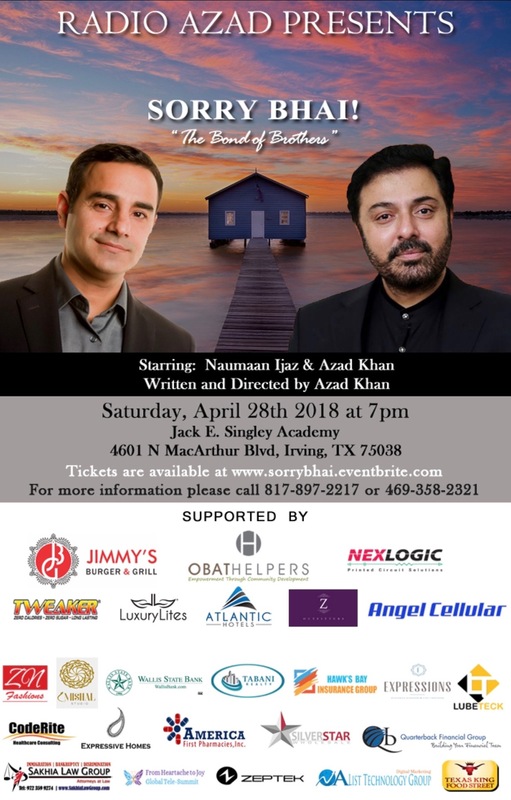 starring Naumaan Ijaz & Azad Khan! Radio Azad brings you a unique and fabulous event!! After the grand success of Aalum-e-Zaat, Radio Azad brings you the Stage Play: "Sorry Bhai!" starring Naumaan Ijaz and Azad Khan! The play is written and directed by Azad. It is a fascinating and gripping insight into the complexities of human emotions and the interplay involving family, love, and personal agendas in our relationships. Saturday April 28th 7pm - 9:30 pm at Jack Singley Academy, 4601 N. MacArthur Blvd., Irving. The play will be followed by an interactive Q&A with the audience! Then strike your best pose on the fabulous Red Carpet where everyone gets to take pictures with Naumaan Ijaz! Food will be available for purchase outside the venue courtesy of Texas King. No Children under the age of 12 years allowed. For more information and group discounts (5 or more) please call 469-358-2321 or 817-897-2217. NOTE: Dress Code: Dress to impress!! Copyright © 2018 Radio Azad, All rights reserved.